I ate a ton of hummus when I in college. It was easy to make. I could dip almost anything in it for extra flavor. It was delicious. And I guess it added some much needed protein to my gummy bears/french fries/donuts diet, not that I cared much about protein at the time. It still remains one of my favorite dips/spreads. And I have made many variations of it. I’ve made it with different types of beans, different stir-ins, and different types of flavoring sauces. But one of my favorites is the Asian-style hummus flavored with roasted garlic cloves and gochujang (Korean chili pepper paste). There is an added benefit to this recipe. I LOVE roasted garlic. And when I make this dip, I make a whole bunch of roasted garlic. What I don’t use for the recipe, I use on my bread. Yum. It’s tastes better than butter (or with butter!). I decided to serve the hummus with some crudités. I also decided to make some cucumber sandwiches. First thing my husband said to me when he saw me making the sandwiches? “How very British of you.” Well. Mine isn’t as dainty as the traditional British cucumber sandwich, but close enough. And with the London Olympics in full swing, it was a perfect snack for the occasion. Preheat oven to 350 degrees. Peel off excess papery skin of the garlic. But be sure to leave enough skin on to hold the bulb together. Cut about 1/4-inch from the top to expose each garlic clove. Drizzle olive oil over the garlic. Wrap with aluminum foil. Place the garlic on a baking pan cut side up. Bake for about 35 minutes until soft. remove from oven and let it cool. Remove the cloves. You should easily be able to do this by squeezing them out of the skin through the cut end. 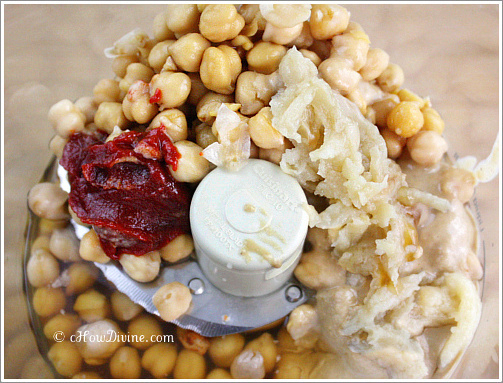 Combine all of the ingredients together – including the roasted garlic – in a food processor. Add a pinch of salt. Process or blend until smooth. If necessary, salt to taste. If desired, garnish with toasted sesame seeds and/or chopped chives. Serve with crudités or use as a spread in a sandwich. It’s also fabulous mixed with noodles or rice for a quick meal. You can make this the day before and store it in the fridge. It actually tastes better the day after when the flavors come together. *Cook’s Note: I found a gochujang made with a glutinous rice base that doesn’t include any gluten-containing ingredients. Usually, gochujang contains wheat from, among other things, soy sauce. However, I would still recommend against consuming gochujang unless it is certified gluten-free if you have celiac disease. 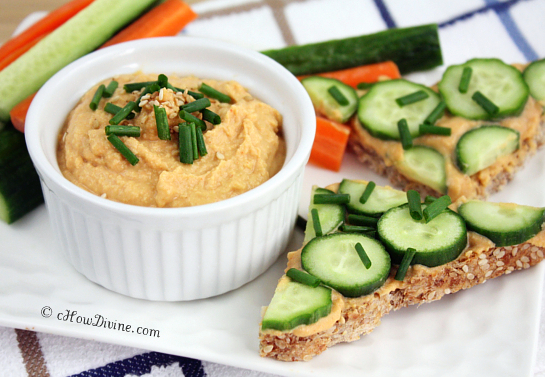 We love hummus around here and your variation with roasted garlic looks great. Will add this to my “must try” recipe collection. Thanks! Thanks Jessie! It’s really delicious. I made another batch for the weekend. It goes pretty fast around here. With its Asian flavors, it’s pretty yummy with noodles and rice as well. Just made this recipe with the following modifications: 1) Used ~2.5 cups chickpeas 2) 2 tbsp. tahini 3) Didn’t have rice vinegar so I used 2 tbsp lemon juice instead 4) We like a little spice around here so in addition to the chili pepper paste I added about 1 tsp. of hot cayenne pepper 4) Didn’t have any Tamari so I used Bragg’s instead. This turned out purrrrrfect. Thanks for the recipe! That sounds yum, Anna! And I love a good hit of cayenne on just about everything 🙂 Thank you so much for letting me know how it turned out! I didn’t have lemon but wanted hummus so I’m glad I turned to you! 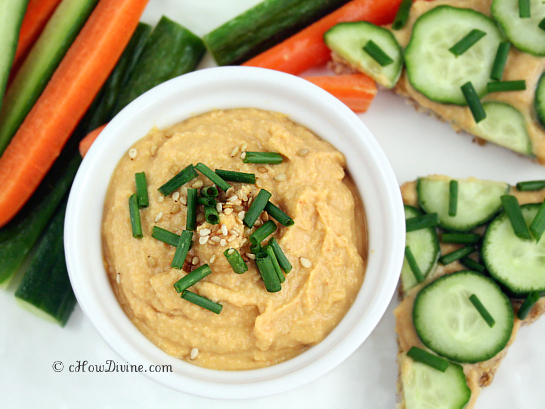 Even without a whole bulb of roasted garlic, the Asian flavors for this hummus is delish. Thank you for sharing! Thank you May! I get requests to make this hummus all the time whenever there is a potluck or a party. It’s especially great when you want something a little different with an Asian kick. I hope you enjoy it. Hope you had a nice weekend! I enjoyed it, as did my co-workers! I brought some leftovers and they were thoroughly impressed because it’s such a different flavor — no wonder you get requests for this! Thanks for letting us know how it turned out! I’m so happy you liked it. It’s definitely a crowd favorite here. Hope you had a lovely weekend!